Chancellor Gordon Brown has spoken of the need for a "new world order" to deal with future security and environmental challenges. He called for a "new diplomacy" to go alongside military power to defeat terrorism, share prosperity and "win the battle of hearts and minds". That meant strengthening Britain's global alliances but also reforming institutions such as the EU and UN. Mr Brown was speaking in Mumbai on the latest stage of his tour of India. 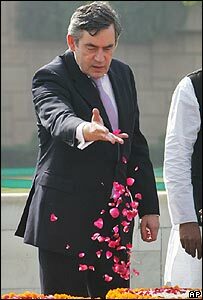 The chancellor said he had been inspired by Mahatma Gandhi as he laid a wreath at the memorial to the former leader. Mr Brown said he was not trying to compare himself to the founder of modern India but was inspired by his strength, courage and strong will. He also quoted Winston Churchill, in an interview with the BBC's Nick Robinson, saying "you cannot meet the challenges of the future by simply building the present in the image of the past". He said the British people wanted a "more secure world," a safer environment and greater prosperity and "that will require new diplomacy in the next few years to build better institutions." Mr Brown said he would not pledge to always seek UN approval before taking military action. "Nobody's going to make that commitment," he said, adding that Britain tried to work through the UN in Iraq, where it now had a mandate. "The American alliance we have, the European cooperation that we welcome and are going to strengthen in the years to come, and our role in the Commonwealth are the basis on which we move forward. "But I believe that there is a collective interest that the world can be persuaded of, in the United Nations playing a bigger role in security, Nato playing a bigger role out of theatre, and also the European Union as a collective institution playing a fuller role in world politics." The Chancellor rejected Northern Ireland Secretary Peter Hain's criticism that the US "neo-conservative" mission had failed. "I don't accept that what America has tried to do has failed," he said. Mr Brown also called for greater international co-operation and a stronger sense of national purpose in meeting the security threat. "If we in Britain can have a stronger sense of what our national purpose is, that will enable us to face the challenges ahead. "That would mean, in practice, we spend more time thinking about what can integrate us as a community and bring us together." Earlier, Mr Brown said he has grown more relaxed speaking about the "big challenges" which will face him as the likely next prime minister. He is widely expected to take over as prime minister when Tony Blair stands down this year. He told the BBC: "It's the right thing to do, to talk about some of the big challenges for the future. "I've been thinking about some of these big challenges. I see the potential for Britain to be a world leader in so many areas in the future. "I also see that we can build that stronger sense of national identity in Britain that will give us strength to face the challenges of the future." His three-day tour to India is being seen an attempt to move beyond fiscal policy and strengthen his international credentials. But the visit has been overshadowed by the row over the alleged racist bullying of Indian actress Shilpa Shetty on the UK reality television show Celebrity Big Brother. Mr Brown has already described as "offensive" the allegedly racist remarks and he faces possible further questions during a visit to a Bollywood film studio in Mumbai. He is also expected to meet industrialists in the city, which is India's financial capital.